Here’s a new recipe that I found in my Country Living magazine for Chilled Cucumber Soup. With the nutrition information listed on the recipe, I calculated it out to be only a 3 Weight Watchers Points Plus Value per serving. In the recipe, I list the serving size as 1 to 2 cups. The Country Living recipe did not specify serving size. It just says that it makes 6 servings. It made a HUGE bowl, so I’m figuring that each serving is at least 1 cup, but probably closer to 1 1/2 to 2 cups. 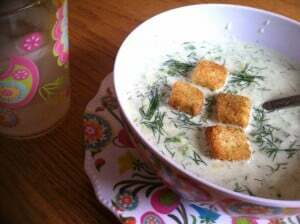 I love the fact that it is a cold soup, especially now during the summer when the temperatures outside are hot and sticky. This soup is so refreshing and very satisfying. In a large bowl, combine 2 cups Greek yogurt and 1 cup vegetable broth; set aside. In a food processor, puree 1 peeled, diced English cucumber, 2 sliced green onions, 2 tablespoons chopped fresh dill, and 2 tablespoons chopped fresh parsley. Add the cucumber mixture, 4 teaspoons fresh lemon juice (a little over 1/3 lemon), and 2 teaspoons salt to the yogurt mixture; whisk to combine. Stir in 1 more peeled, diced English cucumber and 2 more sliced green onions; refrigerate for 1 hour. 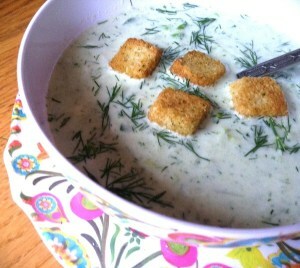 Garnish each serving with chopped dill and croutons. As you can see, it’s a very simple and fresh recipe. The only downfall is the amount of sodium, but you can omit the 2 teaspoons of salt added to the soup. This soup was so tasty. It reminded me of that Greek dipping sauce, Tzatziki, but in a soup form. 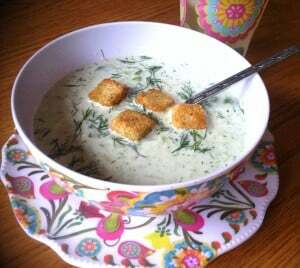 The croutons and fresh dill really add to the taste of the soup. Keep in mind though, that the croutons are not added in to the Weight Watchers Points Plus Value or the nutrition information. So you will need to add that in if you’re tracking for weight loss. The recipe calls for fresh lemon juice. I used lemon juice from the bottle. In my opinion, it’s just as good. Also, if you’re not sure what English cucumbers are, and I wasn’t, they are the longer, thinner, seedless variety. I got my ingredients at Wegmans because of their awesome produce selection, with the exception of the fresh parsley. We have that growing outside so I just picked a bunch. 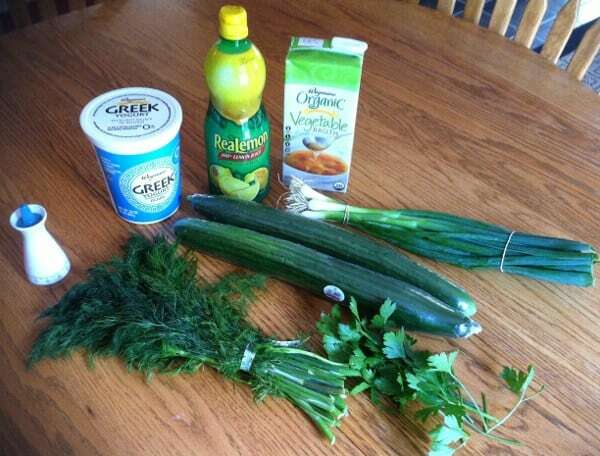 I also used my blender to puree the cucumbers, green onions, dill and parsley because I don’t have a food processor. The blender worked just fine. 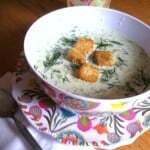 I served this soup as an appetizer to our grilled swordfish and boiled red potato dinner last night. My husband loved it! My son, as I’m sure you’ve guessed by now, wouldn’t touch it, even though he loves cucumbers and croutons. He isn’t a soup eater. Some day! 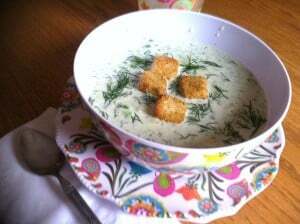 So if you’re looking to make something a little bit different, that’s very satisfying, refreshing and healthy, try this recipe for Chilled Cucumber Soup. I guarantee you, you won’t be disappointed.